Malaysia may not offer the challenge that die-hard surfers seek, but in season, the waves do roll in and the wind does blow at Cherating. Browse places to stay in Cherating on Agoda.com. Free cancellation. Although Cherating Beach’s surf scene relies on monsoon season swells, a fun surf session can be had from roughly October through March with the best waves in December and January. Decent boards and lessons are also readily available. The main operator, Cherating Point, rents long and short surfboards and can also provide tuition. Rates are quite reasonable with plain board hire going for 45 ringgit for a half day, 75 ringgit for a full day and 1.5 hours of tuition going for 140 ringgit per lesson. However their business is seasonal and they close up shop from about April until the beginning of October. Cherating Point also offer a range of packages that include board hire, surf lessons and accommodation, from 320 to 574 ringgit-- these can be quite good value. The steady winds of Cherating Beach make for great kiteboarding and windsurfing conditions and quite popular during the non-surfing months. The flat waters are also beginner friendly. Kam’s Surf Shack will rent both windsurfing (1 hour 60 ringgit) and kiteboard (1 hour 100 ringgit) equipment, in addition to offering lessons in both water sports, but expect to replace broken or damaged equipment out of your own pocket should an accident occur. They also offer surfboard rentals and lessons. For a slower pace, Stand Up Paddle (SUP) boards (1 hour 50 ringgit)and kayaks are available. Don’t like water? No problem, because Kam also has a fierce looking x-sail (30 minutes 60 ringgit) for zipping up the beach on a wind powered 3 wheeler. Helmet included. 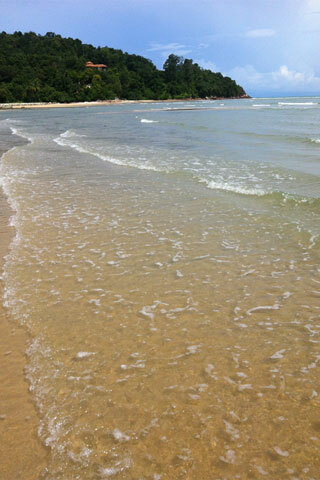 Browse our independent reviews of places to stay in and around Cherating. Read up on where to eat on Cherating. Check out our listings of things to do in and around Cherating. Read up on how to get to Cherating. Planning on riding a scooter in Cherating? Please read this. See below for more sights and activities in Cherating that are listed on Travelfish.org.